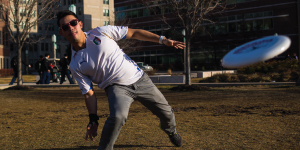 STUDY ABROAD:More than 30% of our students study abroad. Loyola’s Engineering Science programs offer you a chanceto study Engineering at a nationally ranked Jesuit university in the world-class city of Chicago. Our Engineering Science programs emphasize active learning. Classes begin with a short lecture, and the rest of the time you’ll learn hands-on while engaging in small groups.These active learning experiences extend to the lab courses. You will choose from one of three specializations. Each specialization builds on earlier system theory, core engineering, and design courses. Biomedical engineers blend traditional engineering techniques with biological sciences and medicine to improve the quality of human health and life. In this specialty, you’ll learn how to develop, verify, and validate robust software for current and future medical devices. Computer engineers conceive and develop the next wave of computingadvances, innovations, and devices. In this specialty, you’ll train for product, test, or applications engineering positions in semiconductor-related industries. Environmental engineers apply engineering principles to design systems that maintain and improve the quality of our world’s resources. Inspired by our location on Lake Michigan, you’ll learn environmental analysis and management for the water and wastewater treatmentindustries. 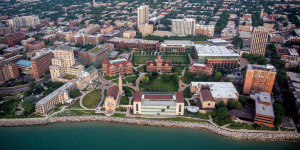 Shaped by its vibrant urban settingand Jesuit tradition, Loyola University Chicago offers a transformative educational environment. We empower students to develop knowledge and skills, find their purpose, shape theiridentity, and make a difference in theircommunity. At Loyola, we offer thetools students need to achieve successin the classroom, their career, faith, life, and the world. We represent and welcome all faiths, ethnicities, and economic backgrounds with a commonpurpose of building a better society. Loyola is located in Chicago, Illinois,the third-largest city in the United States and a global leader in commerce, industry, and culture. Chicago is anextended campus for Loyola students,who have direct access to the city’scountless career, internship, service,cultural, recreational, and entertainment opportunities. 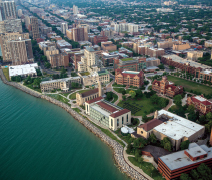 You will take classes primarily at theLake Shore Campus, nestled along Lake Michigan on Chicago’s North Side. Loyola’s reach extends around theworld. The John Felice Rome Center in Italy and the Vietnam Center in Ho Chi Minh City, along with more than150 other study abroad options in 70countries, offer students the chanceto engage with the global community and economy. Course work is integrated from multiple disciplines to give you an opportunity to explore and synthesize topicsfrom a variety of viewpoints. Our distinguished faculty are leaders in theirfields. They integrate research and practical experiences into the classroom. At Loyola, some of the most impactful learning takes place outside theclassroom. Students routinely giveback to the community while exploring their interests and may earn academic credit for their service. Loyolaoffers more than 250 student clubs, activities, and organizations to connect with others, make lifelong friendships, and enjoy a rich college experience.